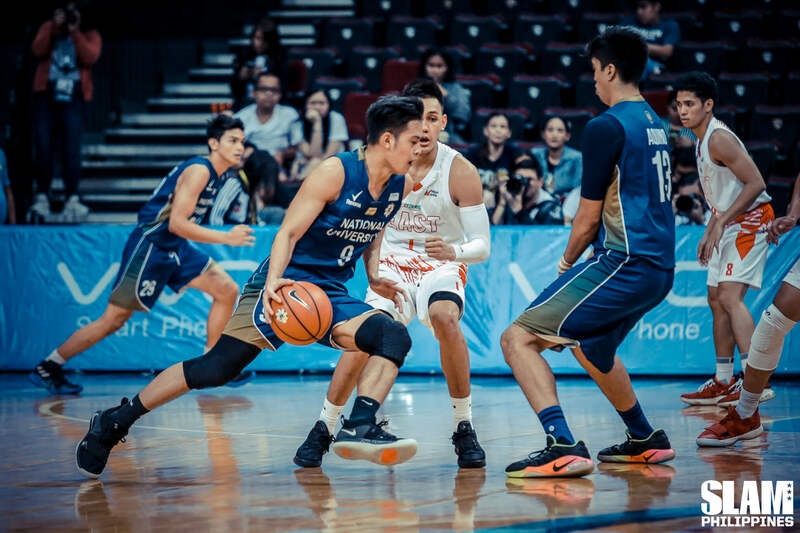 The NU Bulldogs bookended the first round with wins. It took five games, but the Bulldogs finally got their second game of the season. They dominated the UE Red Warriors from start to finish to end the first round the way they started it. NU finishes the second round at 2-5 while UE falls to 1-6. The NU young guns shined in the game. Juniors product John Lloyd Clemente had his breakout game with 21 points built on four treys. Dave Ildefonso stuffed the stat sheet with 14 points, seven rebounds, six assists. Shaun Ildefonso added 12 points and four boards. As a team, the Bulldogs played their best game this season. They shot 48% and assisted on 20 of their 34 made field goals. They out-rebounded UE, 55-31. NU scored 25 points on the break and 19 points off 17 offensive boards. Alvin Pasaol did the heavy lifting in the first period. He scored nearly half of his total output in the opening quarter to help the Red Warriors stay within striking distance of the Bulldogs. UE was only down by four points after the first quarter. But they just couldn’t keep up with NU. Clemente and the Ildefonsos teamed up in the second period to score 21 of the team’s 33 points. The Bulldogs jumped out to a 21-point lead heading into halftime. Clemente kept NU ahead in the third period with nine points in that stretch. He nailed crucial outside shots to keep UE at bay as NU cruised to the win. In danger of falling into a three-way tie for the fourth spot, the La Salle Green Archers played clutch basketball in the final minutes of regulation and OT. They take down the Adamson Soaring Falcons, handing them their second loss of the season. La Salle is at solo fourth at 4-3 while Adamson is at a three-way tie on top at 5-2. It was a wild game of runs between both teams. The Green Archers started the game out strong as Aljun Melecio and Justine Baltazar teamed up to lead their team. Jerrick Ahanmisi came alive in the second period to get the Falcons back in the game. The two teams traded 7-0 runs in the third period to keep the game knotted at 49 heading into the final quarter. Adamson was up by five points heading into the final three minutes with Ahanmisi and Sean Manganti leading the way. 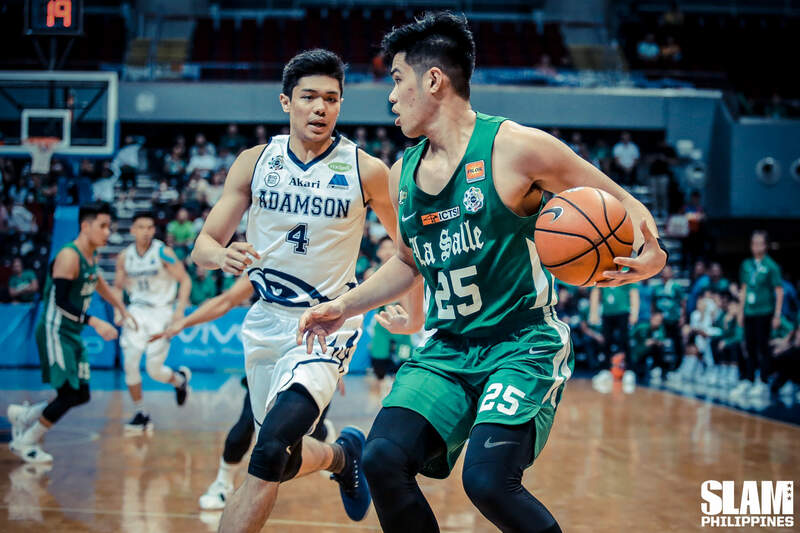 The Green Archers were searching for offense and got a spark from Santi Santillan. The forward nailed a crucial trey to get La Salle back in the game. With less than 20 seconds left in regulation, La Salle was down by two points so the leaned on their best scorer for the biggest basket of the game. Aljun Melecio attacked the midrange area and lofted a floater over Papi Sarr to tie the game. La Salle’s defense held steady in the final possession forcing a Manganti miss to send the game into OT. The Falcons OT woes from the last game continued to haunt them in this game. The Green Archers started the extra period with a 9-0 run with Baltazar, Santillan and Melecio leading the way. Ahanmisi and Manganti went on a last gasp run to try to get the win. But Montalbo’s free throws iced the game nullifying Ahanmisi’s trey at the buzzer. Melecio led the Archers with 22 points, four rebounds and two treys. Baltazar and Santillan each scored 16 points. The two bigs also combined for 19 rebounds.